How much is a human life worth? How much is our future and that of our children worth? Well, the answer to both is “not too much” if Eskom and Sasol’s pollution-friendly tactics are anything to go by. While it might involve increased costs for Sasol and Eskom to reduce their pollution, overall if we count the costs to society we might find that reducing pollution might save us quite a bit, especially if we value human health, life and well-being properly. To be clear, this is not just about tree-hugging hippies and saving the polar bear. It is about human life, health and well-being. In the present the costs of pollution from Sasol and Eskom comes in the form of “a soup of polluting compounds, including sulphur, nitrous oxide and particulates, each linked to specific negative health and environmental impacts. Other noxious chemicals included in this brew include radically toxic substances like cadmium, chromium, lead, barium and mercury”. Those words come from a more comprehensive article by Glenn Ashton, who also points out that in places like Witbank, South Africa’s air is more polluted than even China’s infamous pollution levels. So when even the Chinese populace with its history of repression and censorship is protesting pollution, why does South Africa with its rich history of protest and civil-society engagement stay largely quiet? We might think we are saving by not complying with these regulations, but to believe that is to be rather narrow-minded, for while the costs of pollution may not appear on our energy bills or on Sasol or Eskom’s balance sheet, they are still borne by us. They are borne by the South African populace in the form of loss of life, illness, polluted air and the deterioration of our climate and ecosystems. In fact the costs of coal pollution, for instance, are so bad that their damages likely outweigh their benefits. 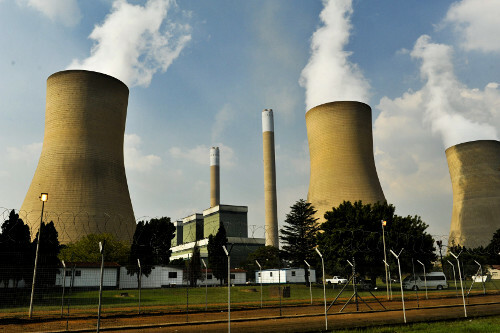 While Greenpeace issued a study claiming that Eskom’s power plants kill 2 220 people prematurely each year, a less controversial study by world-renowned Yale University economist William Nordhaus showed that the value added to an economy by coal was outweighed by the damage it causes. In other words, if we incorporate the harm caused by coal power into our valuations, coal power turns out to cause more damage than good. (Nordhaus’s rather conservative economic analysis was done, furthermore, in the US where coal power is significantly cleaner than South Africa, thanks in no small part to Eskom and Sasol’s aversion to cleaning up their acts). While the present harms through air pollution are pretty darn worrying, ensuring Eskom and Sasol clean up their act is also about ensuring a liveable environment and climate in the future, rather than one defined by climate chaos. The sort of climate chaos that will push large parts of South Africa into drought and in many places when the rainfall does come, it will be less frequent and in violent downpours that will cause flooding and soil erosion. Many of those impacts, like that of our current pollution, will fall disproportionately on the poor and vulnerable sectors of our society. As Oxford University economics professor Dieter Helm argues, “the overwhelmingly immediate question in climate change is how to stop and then reverse the dash-for-coal, and to do it quickly”. That is because coal accounts for the majority of global greenhouse gas emissions and generally emits three times more greenhouse gas emissions than other fossil fuel sources of energy, never mind renewables. In South Africa, however, we seem to be going in the opposite direction as we forge ahead with installing two of the world’s largest coal power plants, in the form of Medupi and Kusile. (Ironically, the name Medupi comes from the Sepedi word for “rain that soaks parched lands”, the very thing Medupi might contribute to less of). So, to sum up, Eskom and Sasol are opposing environmental legislation put in place to protect us from the harmful effects of their actions, and in doing so they are continuing to expose us to deadly and harmful pollution that wreaks havoc on our present health and well-being, and weakens the prospects of a decent future by its contribution to climate change. We shouldn’t be happy about this. So, what to do? I want to encourage you to raise your voices to ensure that companies like Sasol and Eskom properly value human life and well-being, both now and in the future. On September 20 and 21 tens if not hundreds of thousands of people around the world will be marching for a better future and environment – check out peoplesclimate.org. Right now, however, South Africa isn’t even on the digital map. So let’s get on the map and connect our protests to these important domestic issues. To borrow from a recent advert, Eskom and Sasol have a new pollution filter, and it is us, and will continue to be, unless we change that. Alex is a South African Fulbright and Mandela Rhodes Scholar getting his PhD in philosophy at the University of Washington, Seattle, focusing on climate justice.